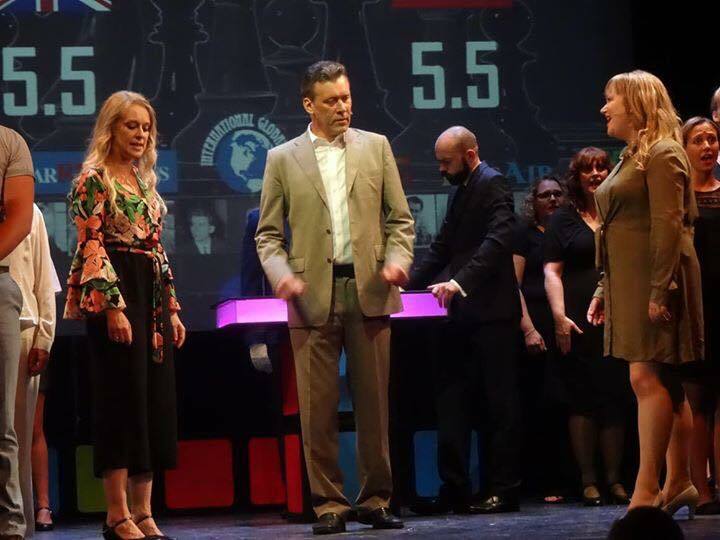 Review: Chess by The People’s Theatre Company – Nottingham. – East Midlands Theatre. 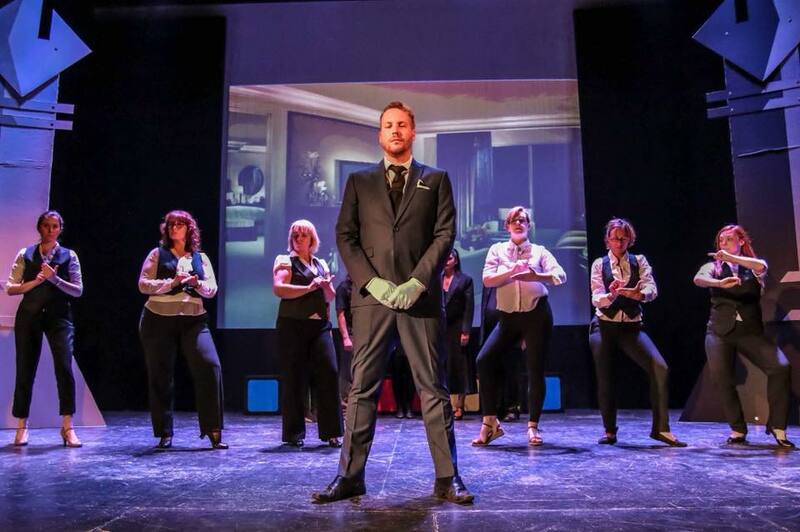 Review: Chess by The People’s Theatre Company – Nottingham. Political unrest as a background to a play or musical can provide the story with some proper meaty stuff to work from and with. 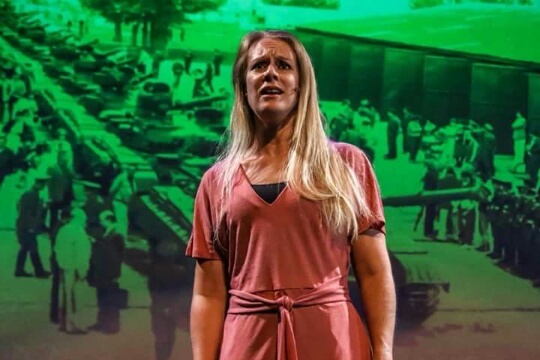 Just think Miss Saigon or Les Misérables, both shows set amongst periods of great civil unrest and war. The musical Chess sits itself within past and present historical contexts with the contemporary playing centre being the early 1980s. During these times the dangers from the USSR have influenced the Cuban Missile threat. The 1956 Hungarian Revolution hangs grimly in the memories of the Hungarians. There is unsteady and shifting politics of the Warsaw Pact, and general unrest in Eastern Bloc Communist countries. Capitalism alongside imperialism in the West historically made for powder keg moments just waiting to explode. Mistrust is everywhere. In the politically charged world of international Chess tournaments Russia was virtually unbeatable and had been for decades. The real life story of USA Chess maverick Bobby Fischer versus USSR’s Boris Spassky forms the basis and grand inspiration for the musical Chess – excepting the opponents have different names and theatrically enhanced lives, complete with lovers and defections. In Chess, attack and counter attack, deceit and surprise, deep desires for the game of chess and the tricksy games of human desire abound. The critical mental aptitude to ‘be and 100% remain’ an absolute world champion winner is without question in each of the main chess playing protagonist’s minds and total being. Tim Rice has described the musical as being a ‘wayward child’. 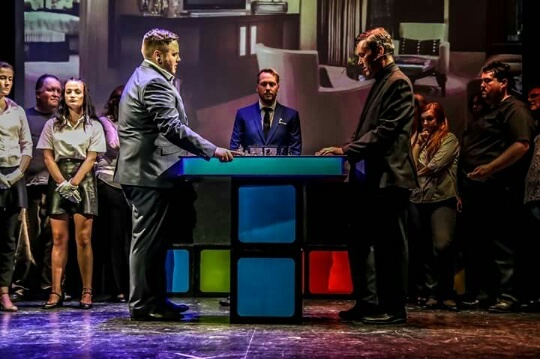 The other creative Chess partners, Benny Andersson and Björn Ulvaeus, agree, adding that ‘the continued enjoyment in it lies not in any rigid and predictable storyline but in the fascinations to be found in the conundrums of the central characters. 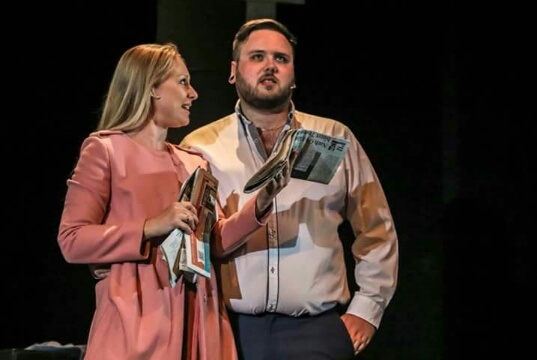 It is a show about dilemmas rather than solutions and productions find its essence incarnated through new possibilities as much as established certainties.’ So, very unusually for a musical, permission has been granted to play around with the placement of songs and structure as long as the central story gets truthfully told. The amateur People’s Theatre Company, Nottingham, through their director Meng Khaw, have done just that. 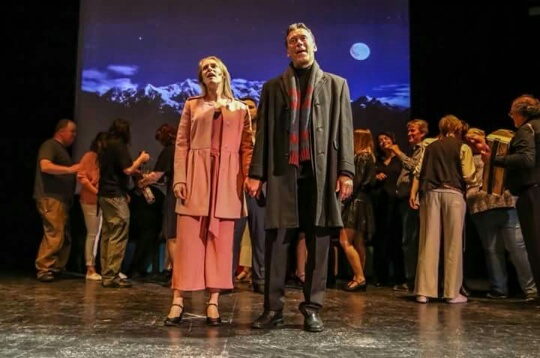 They have arrived at a staging which contains the central stories but adds much more insight to the journeys of the characters and their final denouement. The addition of extremely well thought through sections of imagery both still and video based, projected on to a large background screen, massively helps with the story telling and has real professional authenticity built into its visual creations. This impressive audiovisual design is the work of Chris Collins, Meng Khaw and Gareth Morris. The live orchestra featuring keyboards, violin, cello, flute and piccalo, clarinet, trumpet, lead guitar, bass and percussion do an excellent job with a very complex and varied score and challenging arrangements. The general sound quality and diction of the central characters is commendable and a particular bonus in an amateur cast without professional training. In sung drama and straight drama it is vital we actually hear the words of the songs/text, even if the actors are miked up, otherwise how do we follow the story? This version of Chess very much seems to be the character Florence’s story (Kate Taylor) as much as the Russian Anatoly Sergievsky (Rob Goll) and Frederick Trumper (Sam Barson). Whilst there are some well trained and applied musical theatre voices in this grouping, Taylor’s singing and acting is exceptionally good. As Florence she has the talents to cope with such numbers as ‘Quartet’, ‘1956, Budapest is rising’, ‘Nobody’s Side’, ‘Mountain Duet’, the stirring ‘Heaven Help My Heart’, ‘You and I’ and the infamous duet ‘I Know Him So Well’ sung with the excellent Zozia Kuczyńsha as Svetlana Sergievskaya. Kuczyńsha’s ‘Someone Else’s Story’, has real ring of genuine feeling to it and although she is on the stage a comparatively short time in Chess Kuczyńsha makes the most of her part as the distant wife of Anatoly Sergievsky. Goll imbues his quiet Russian character Anatoly Sergievsky with a great deal of inner strength and fortitude. 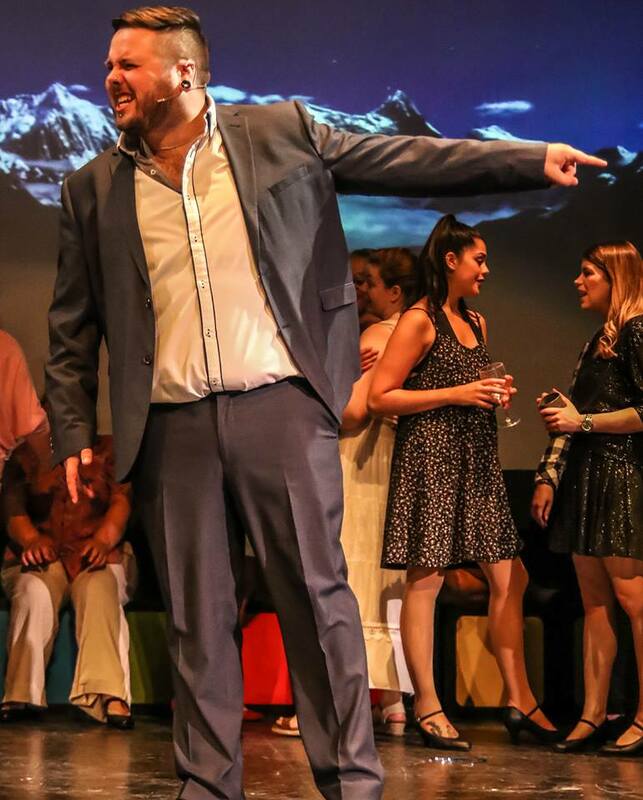 Goll’s tremendous acting skills help balance out his lesser experience in singing. 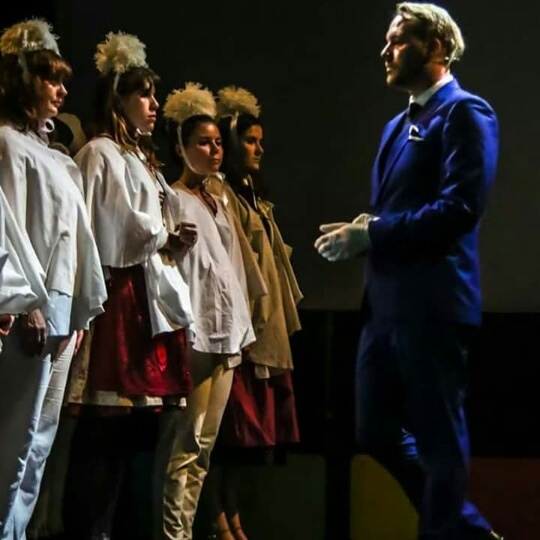 Goll has clearly worked hard to up his game and sings a majestically belting version of ‘Anthem’ as well as the ambitious ‘Where I Want To Be’ plus various duets with Florence and other sung through material. His work is one of the triumphs of the evening. Sam Barson’s Frederick Trumper, a US chess playing bad boy is enjoyably played and dramatically sung by Barson. His part has some of the meatier songs and he clearly revels in his abilities to hit the high notes in ‘Rock Merano’, ‘One Night In Bangkok’, ‘Talking Chess’, ‘Florence Quits’ and is super exciting in his raw version of ‘Pity The Child’. Barson makes Trumper less of an arrogant hate figure and more of an annoying childish and attention grabbing, űber talented chess player. John Gill’s The Arbiter is spot on vocally and Gill puts in a commanding performance with great authority. As chess playing second, Alexander Molokov, Chris Collins’ performance is perhaps the surprise of the evening. 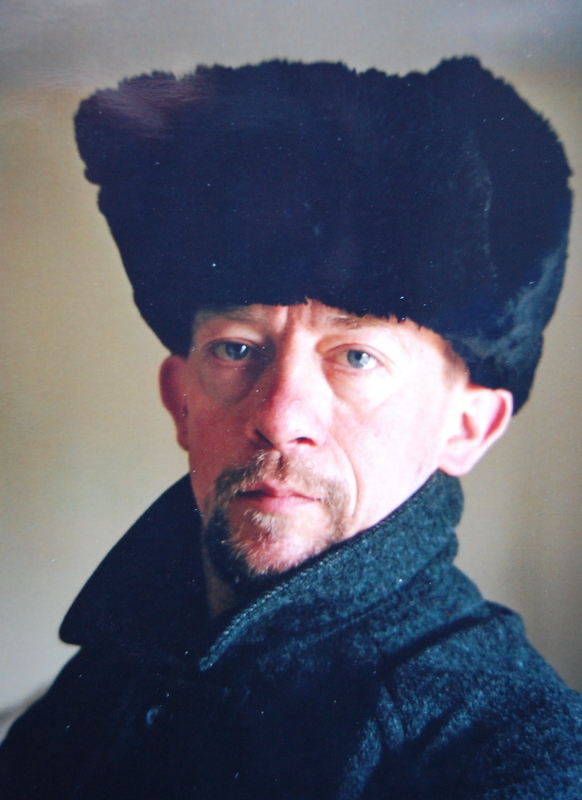 Collins has a strong and personality full singing voice and he has real stage presence and authentic accent on all of his songs including ‘Soviet Machine’ and the menacing ‘Anatoly and Molokov’. Curtis Taylor -Tipton is professionally confident as head of an American TV corporation character Walter de Courcey and sings beautifully. The large ensemble do a fantastic job with the general chorus work and choral number ‘Endgame’ and this reviewer particularly likes their ‘Embassy Lament’ and wishes it had a well deserved round of applause. The Chess Championships 1 and 2 work well with the crowds watching facing forward but the inclusion of the dancers in this viewers opinion is a mistake. The dramatically scored chess games are enough to hold an audience’s attention for the duration. The ballet dancing element distracts although the two girls are very confident in their dancing. Cris Brawn’s set design with its giant Russian style knights and pawns really sets the scene for the show and Rob Kettridge’s sound is pitch perfect in the Arts Theatre where sound issues have been difficult to resolve with its high auditorium ceiling. 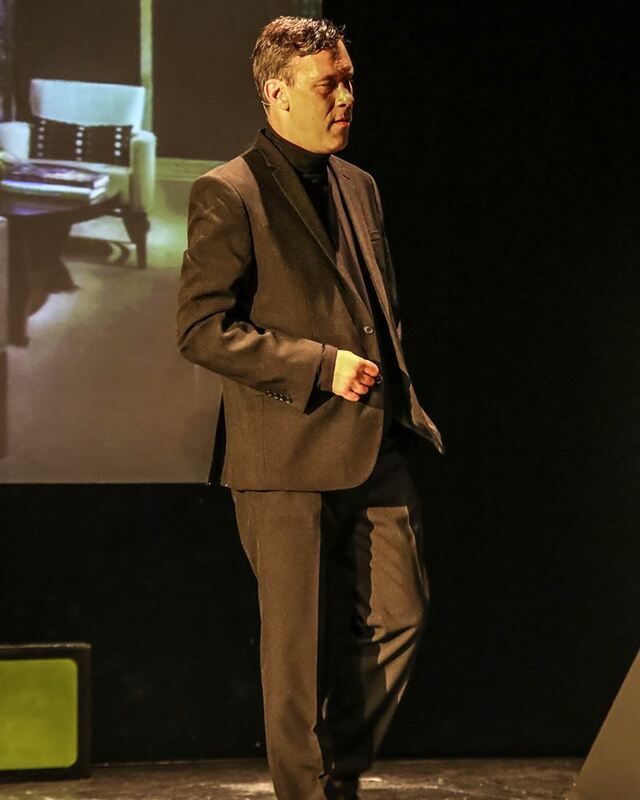 Chris Mercer’s lighting design works on many levels to build the drama. The lighting of the chess board table is pure cheesy 1980s genius. 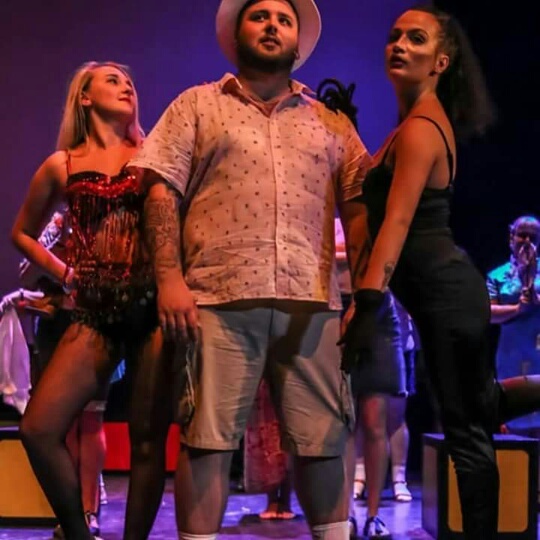 For a chance to visit a brilliant and complex musical that has a quality cast and plenty of enthusiasm and talent one should seriously consider booking as soon as possible. 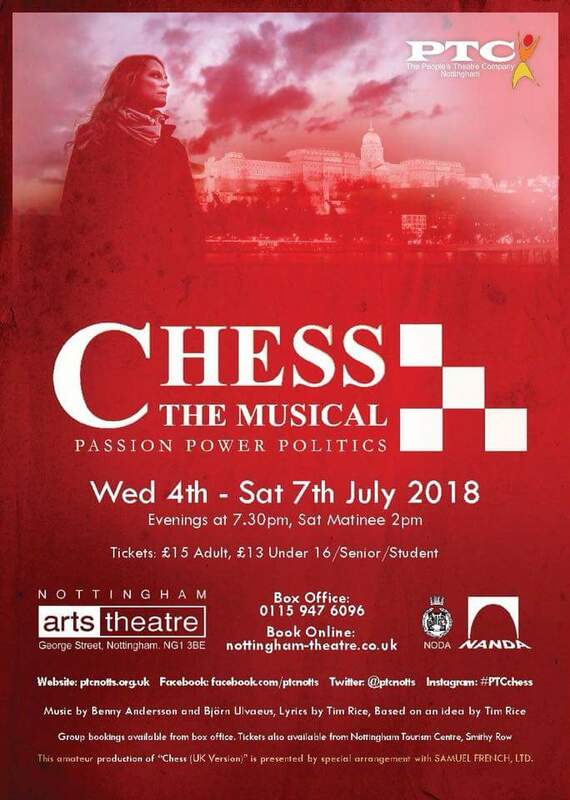 Chess at The Nottingham Arts Theatre runs until Saturday 7th July. Click on Facbook image below to join us, ‘like’ and share. Promo: Fiddler On The Roof costume designs. Curve Leicester.